Designer Patricia Michaels' (Taos Pueblo) Native American Couture. 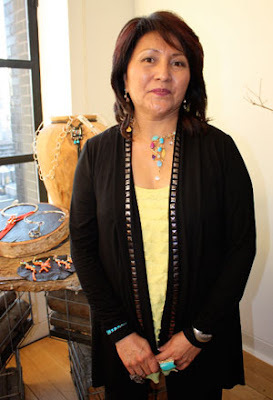 Zuni Jewelry Designer Veronica Paoblano. 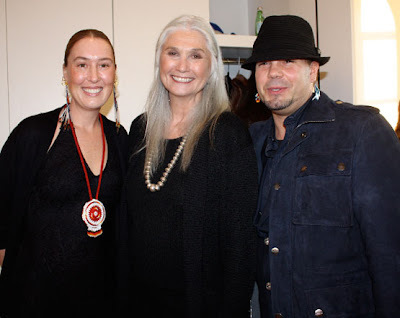 Filmmaker Anna Fischer, Founder UnReserved Gail Bruce, and Steve Goodman. The Native NY fashion event was covered in the New York Social Diary. Unreserved presented new Native American Fashion and Accessories. Of special note the exquisite jewelry by Veronica Poblano (Zuni) fabricating traditional iconography into new, colorful work and the beautiful first couture collection of Designer Patricia Michaels (Taos Pueblo). The post was meant for those of us who are not in the fashion business (aka those of us who couldn't make it past the red ropes of NY Fashion Week). One of the goals of the UNRESERVED Alliance is to increase coverage of Native artists and designers in New York, the art and fashion mecca of the U.S.